Looking for something different to hang on your door this holiday? This bright and vibrant holiday wreath will make your front door pop with holiday spirit. Complement your home's natural beauty during the holidays, through out Christmas time, or leave it up year round; this battery operated wreaths is sure to be a show stopper. The unique - handcrafted design of our boxwood leaves is complimented with red and yellow berries accents that are sure to brighten up your day. 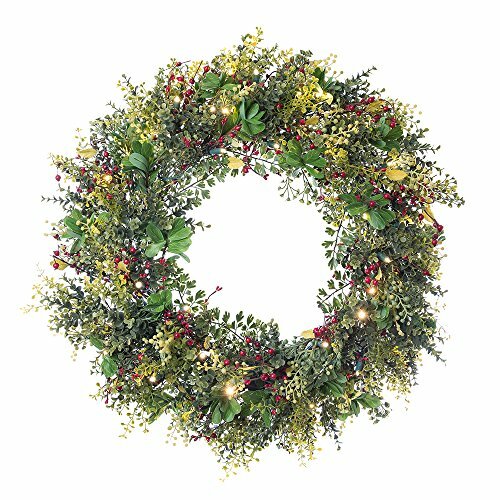 The Christmas Boxwood & Berry Wreath is the perfect artificial front door wreath for minimalists who love simple, yet elegant addition to their door. The UV coating adds durability to withstand the outdoor weather, or hang indoors above your mantle. This decorated wreath comes fully equipped with a steel frame which makes hanging effortless, and maintains its shape for seasons to come.